Gigabyte X299 Aorus Gaming will be the first motherboard in the world that’s powered by Kaby Lake-X. Competitors to Gigabyte are rumoured to launch new models on this processor later this year. Gigabyte claims that Aorus X299 is the worlds fastest motherboard. Ingenious cooling employing thermal heat sinks, 5 hybrid water pump headers and six temperature sensors allows for intensive gaming usage. One might worry that the PC will be rather noisy with all the cooling that the motherboard employs. Gigabyte has therefore invested in an intelligent Fan Stop technology, which minimises fan usage based on local temperature measurements from the various sensors located on the motherboard. Aorus Gaming’s LED set-up is extremely customisable using the RGB Fusion App that’s available from either Apple’s app store or Google Play for the Android version. The app is straightforward to use and enables you to optimise the set-up for your particular needs and type of game played. For example, multiple zones can be managed independently. Users can connect to each individual LED strip, which is identifiable using an address, through an extension cable. Hence, it’s possible to manage the lightning on the board on a very detailed level. 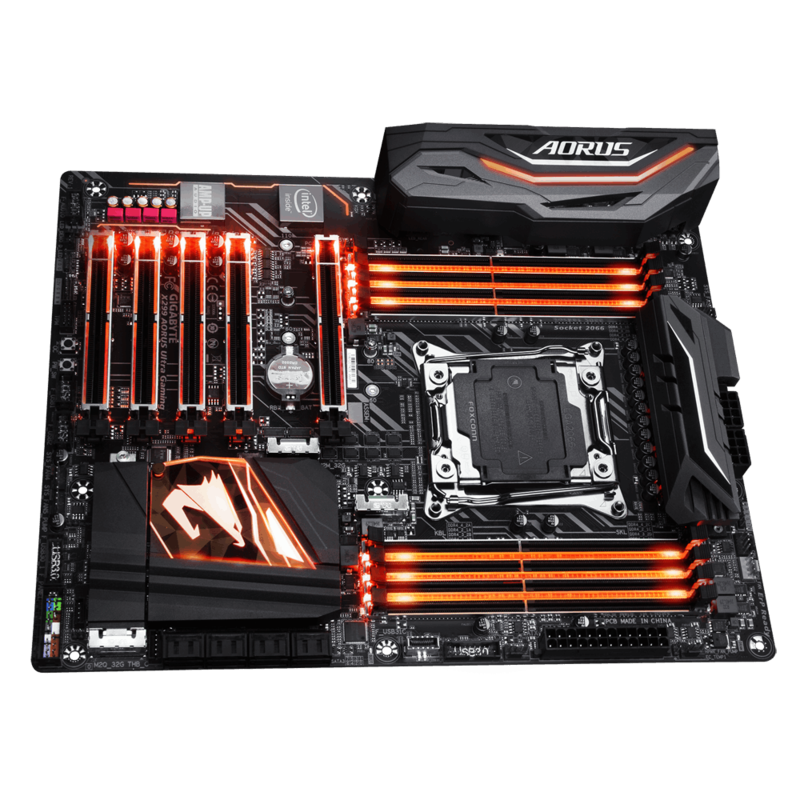 Gigabyte X299 Aorus Gaming only features four DDR4 DIMM slots. There are plenty of memory options to choose from ranging from 4 GB RAM til 64 GB of RAM. Connectivity is lightning fast using eight SATA ports operating at 6 GB/s. Gigabyte X299 Aorus Gaming only supports Intel Core i7-7740X and i7-7640X with 4 cores processors. Hence, there’s no way to use this motherboard with Skylake-X. Aorus Gaming is well suited to play an integral part in a VR system due to NVMe support through either M.2 or U.2.